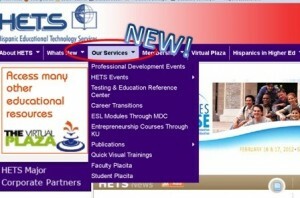 In order to facilitate the navigation the HETS website, recently it was redesigned to improve both its image and functionality. It contains an easy to navigate and clean structure that, at the same time, conveys an organized series of modules easy to manage and maintain updated. The main menus have been reorganized and a result, the new Our Services menu was created. On this new section HETS Members will have the chance to look at- a -glance of all the benefits they can take advantage of. From here they will learn about Professional Development Events, HETS Events , and our Publications. One of the most innovative additions is the online registration to our Professional Development Events and the Second Best Practices Showcase. Also, by just one click, Member Institutions can get access to the Testing and Education Reference Center (TERC) to allow their students access e-books, practice and get prepared on-line for admission tests at The Virtual Plaza. In collaboration with member institutions, they can get access to the online writing lab, entrepreneurship courses, as well as online career guidance through the Career Transition Center. In addition to its structure and look, the website includes several tools acquainted to the new trends in technology and social media. The icons to access links to HETS You Tube channel, Facebook and Twitter accounts were also added to the main page. At the same time during this semester The HETS Virtual Plaza it’s being redesign as well to better serve the needs of faculty and students that visit it. Once again, we have proved that the HETS website is prepared to add new functionalities and adapt itself to the future Internet, educational and social trends. We encourage you to see by yourself, visit www.hets.org today so you start enjoying all the benefits that are waiting for you. It’s more than Higher Education, it’s a Higher Vision.